I am writing today concerned about the electoral redistribution of South Eastern New Brunswick. As the province’s largest urban centre, the Greater Moncton Area (GMA) identity is entrenched both French and English cultural production. In politics, we see this characteristic mandate a bilingual imperative for elected representatives. My concern is that the proposed ridings of Moncton-Riverview and Beauséjour–Dieppe do not best reflect the characteristics of the region. The GMA has a total population of 138,644 including the cities of Moncton (69,074), Dieppe (23,310), and the town of Riverview (19,128). The region is New Brunswick’s largest urban centre and hosts one of Canada’s largest Francophone populations outside Quebec. The three communities of the GMA have very distinct linguistic profiles; based on 2006 census Riverview reported 91% English as mother tongue and 97% using English as language spoken most often at home. The officially bilingual city of Moncton reported 33% French mother tongue with 26% using French as primary home language. Francophone Dieppe reported 74% French only mother tongue and 71% speaking French most at home. New boundaries will slice off Dieppe and annex it into neighbouring Francophone riding Beausejour, held by Liberal Dominic LeBlanc. 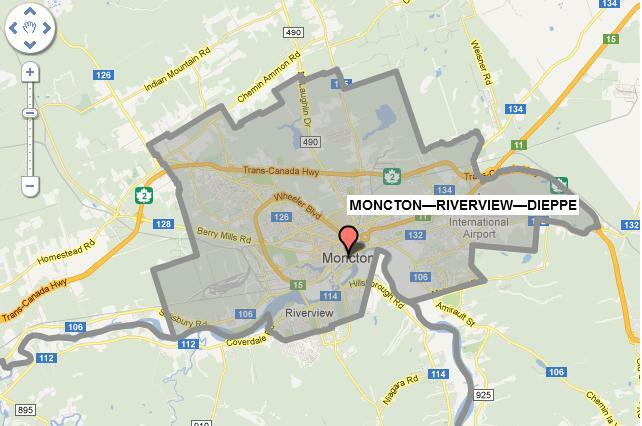 Meanwhile, the new urban Moncton-Riverview riding will have a much anglicized language profile as the francophone population in the riding falls from 31.61% to approximately 20%. Decreasing the francophone population from 1/3 to 1/5 largely degrades the bilingual imperative of elected officials. Further, the decrease also puts the francophone population in the riding well below the provincial proportion of 33% and the GMA average just below 32%. A better redrawing of South Eastern New Brunswick would create a Moncton-Dieppe riding and annex Riverview to the neighbouring riding of Fundy Royal. Moncton and Dieppe share city status and are more socially and physically integrated than Moncton and Riverview: they’re both on the same side of the river, the Greater Moncton International Airport and Champlain Place Mall are in Dieppe, and they both have sizeable groups of minority language speakers. Further, a Moncton-Dieppe riding would represent the uniquely New Brunswick perspective of a truly urban French-speaking riding outside of Quebec. Fundy Royal is simultaneously a good home for Riverview. Part of the town is already in the riding, and the inclusion of the rest of Riverview stays true to the nature of Fundy Royal as the mixed largely-rural area between the province’s three southern cities. Lastly, the language profile of the riding, 95.1% English, is essentially unchanged with the potential annexation of Quispamsis and Riverview. If Riverview is to be annexed into the Fundy Royal riding the addition of Quispamsis would cease to require emphasis in the riding’s name. Fundy Royal would endure as an appropriate name. I hope the concerns and ideas presented resonate with you and that their merit is reflected in the redrawing of South Eastern New Brunswick's ridings.